SCRIBA, NY – An attached garage at 58 Skyline Drive, was heavily damaged Wednesday night by fire. 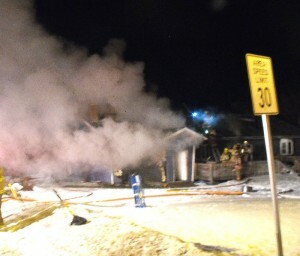 Smoke billows from the fire at an attached garage at a Skyline Drive residence in Scriba late Wednesday night. More than a half dozen fire companies battled the blaze. It was reported at 9:52 p.m. The garage was fully involved as the first firefighters arrived on the scene. There were two people in the attached house; both made it out safely and were being treated at the scene by EMTs. The house belongs to Shawn and Deborah White.